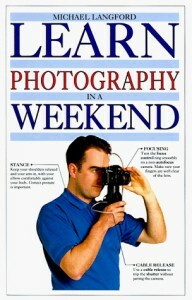 Learn Photography in a Weekend, Michael Langford, Knopf, 1992, ISBN 9780679416746, 96pp. What better way to learn about photography than an instruction book filled with lots of pictures, right? Unfortunately, no. While Michael Langford’s Learn Photography in a Weekend has a large number of examples, the text that accompanies the pictures isn’t detailed enough to fully explain what it is that you are supposed to be seeing in those pictures nor is his description of how to use the camera to achieve these results comprehensive enough. The book centers around using an SLR or compact film camera, which would have been appropriate enough in 1997 when this book first came out, but in the nine years since, digital technology has overtaken the camera world and, while the general understanding of exposure and focal length still applies, the use of a digital camera is different enough that I felt I needed a conversion table between SLR and digital concepts. Which means I was quite disappointed with this book, although I should have checked the publication date before I started it. I’ve gotten more interested in photography recently, having finally embraced flickr as a means for photo sharing, and was looking for something to help me understand what makes one picture better than another, other than the simple gut feeling you get by comparing two. I came away with some new knowledge from this book in that regard, however, including issues of lighting, framing (especially with the use of the zoom lens), and composition. Even in these areas, though, I would have liked even more examples and more discussion of how the examples illustrated his point. This is an extremely short book (less than 100 pages), and might be useful to introduce you to some photo concepts, but as for actually learning photography in a weekend, I don’t think this is the right teacher.